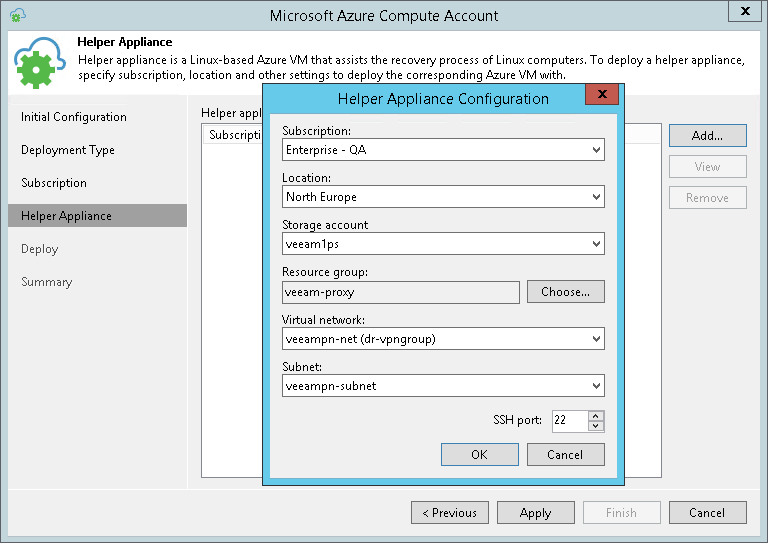 Veeam Backup & Replication requires a helper appliance to restore Linux machines to Microsoft Azure. The helper appliance is a small auxiliary VM in Microsoft Azure registered by Veeam Backup & Replication. During the restore process, Veeam Backup & Replication mounts disks of the restored machine to the helper appliance to prepare these disks for restore. You must configure a helper appliance in the location to which you plan to restore Linux machines. If you plan to restore Linux machines to different locations, you must configure several appliances — one appliance in every location. Helper appliances are persistent. After you set up appliances, they remain in Microsoft Azure in the powered off state until you start the restore process. 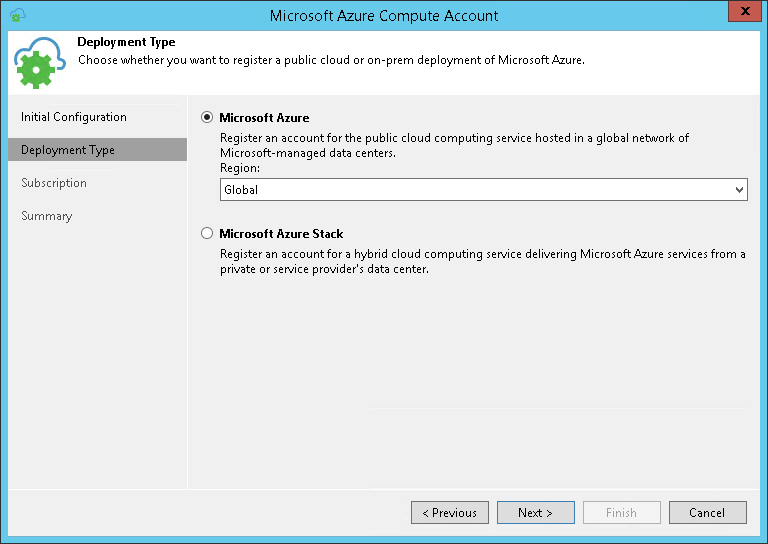 Microsoft Azure will bill you for storing helper appliances disks in the storage account. 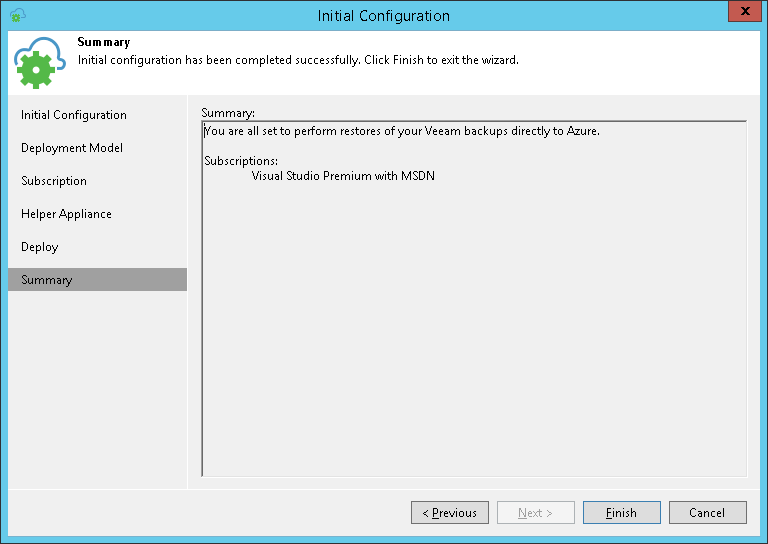 Veeam Backup & Replication uses a built-in credentials record to work with all helper appliances. For security reasons, it is recommended that you change a password for this account before you set up the helper appliances. For more information, see Changing Credentials for Helper Appliances. 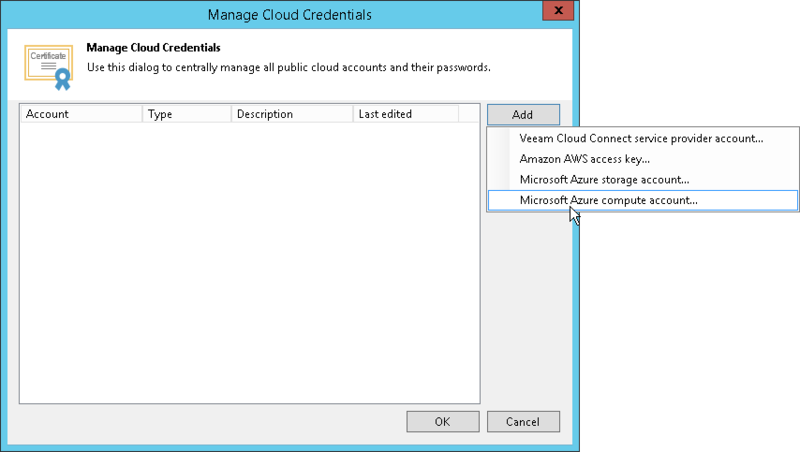 In the Manage Cloud Credentials window, click Add. If you edit an existing account, select it in the list and click Edit. At the Deployment Model step of the wizard, select the necessary deployment model. At the Subscription step of the wizard, select the Enable restore of Linux-based computers check box. At the Helper Appliance step of the wizard, configure settings of the helper appliance. On the right of the Helper appliances list, click Add. From the Subscription list, select a subscription whose resources you want to use to configure the helper appliance. 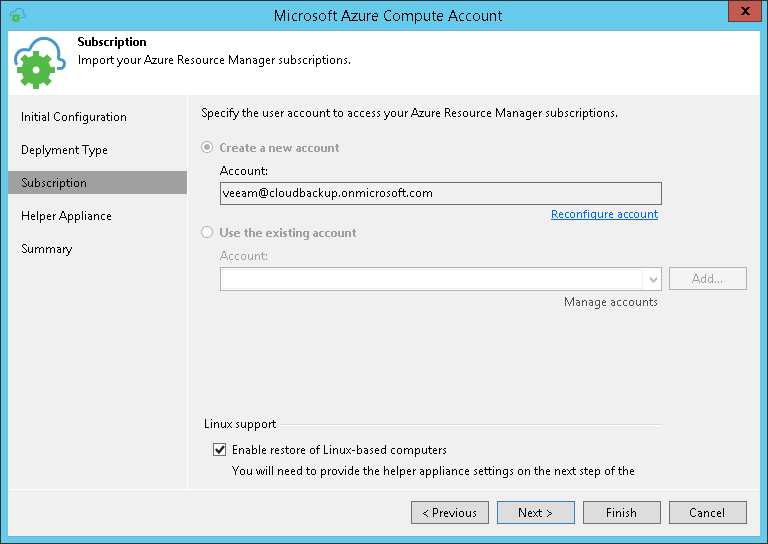 The subscription list contains all subscriptions that are associated with the Microsoft Azure user account. From the Location list, select a location in which you want to configure the helper appliance. Make sure that you select a geographic region with which at least one storage account of the subscription is associated. From the Storage account list, select a storage account whose resources you want to use to store disks of the helper appliance. [Optional] Click Choose if you don't want Veeam Backup & Replication to create a new resource group. From the Virtual network list, select a network to which the helper appliance must be connected. From the Subnet list, select a subnet for the helper appliance. At the SSH port field, specify a port over which Veeam Backup & Replication will communicate with the helper appliance. By default, port 22 is used. Repeat steps from a to i for all locations to which you plan to restore Linux machines and click Next. 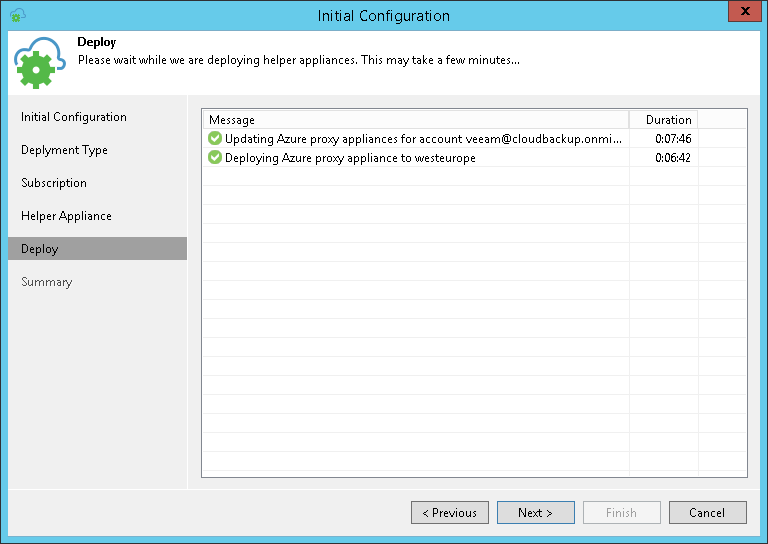 At the Deploy step of the wizard, wait until Veeam Backup & Replication configures the helper appliance in Microsoft Azure. The appliance will remain powered off until you start restoring Linux machines to the necessary location in Microsoft Azure. At the Summary step of the wizard, review summary information and click Finish to close the wizard.